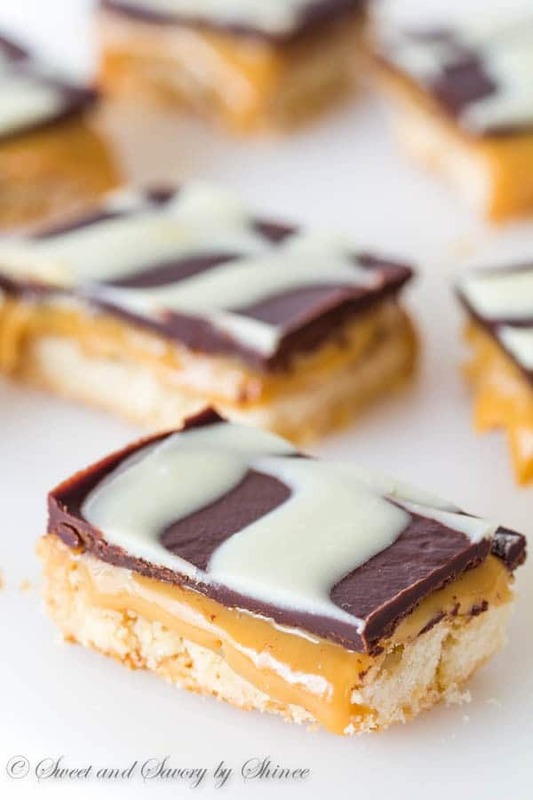 Thick, gooey caramel filling over buttery shortbread cookie and covered with swirled chocolate ganache is the golden ticket to get anything you want. These bars were inspired by the very first sweet treat I had in London earlier this year. 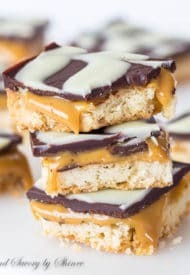 Ever since I had it, I’ve been haunted by my desire to re-create my version of this sweet indulgence. Seriously, what’s not to love here? Chocolate. Dulce de Leche. Shortbread. Yum! The fancy swirled look might seem too complicated, but it really isn’t. I promise. If you have a toothpick, you’ve got this! And instead of making caramel from scratch, I’m using dulce de leche. The most fabulous shortcut ever! Preheat oven to 350°F (175°C). Line 13×9-in baking sheet with parchment paper. In a medium bowl with paddle attachment, beat butter, sugar, salt and vanilla until well combined, about 2 minutes. Add the flour and mix on low speed just until combined, about a minute, scraping down the sides of the bowl once. 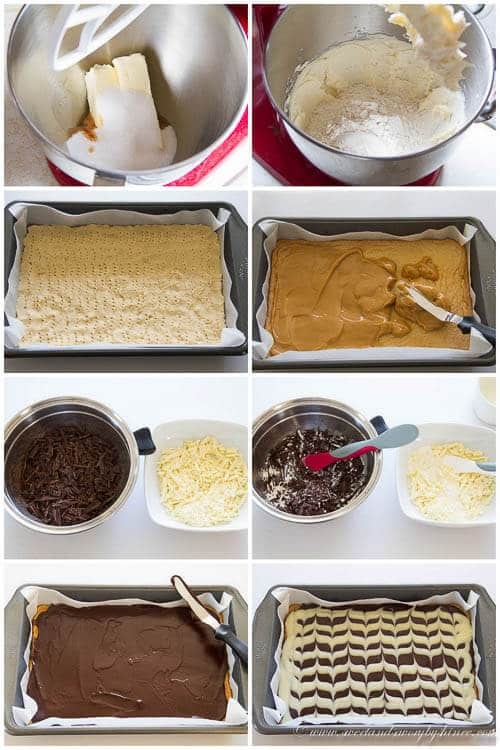 Press the cookie dough into the prepared pan. Bake the cookie for about 23-25 minutes, or until golden brown. Cool completely on wire rack. 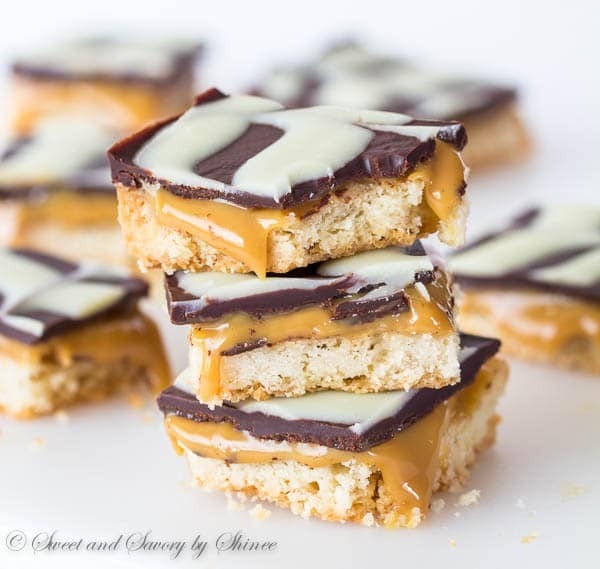 Pour dulce de leche on the cooled shortbread cookie and spread it evenly. Refrigerate, while you prepare the chocolate. In two medium heatproof bowls, place dark and white chocolates in each bowl and divide the heavy cream into each bowl. Melt the chocolates over simmering water. 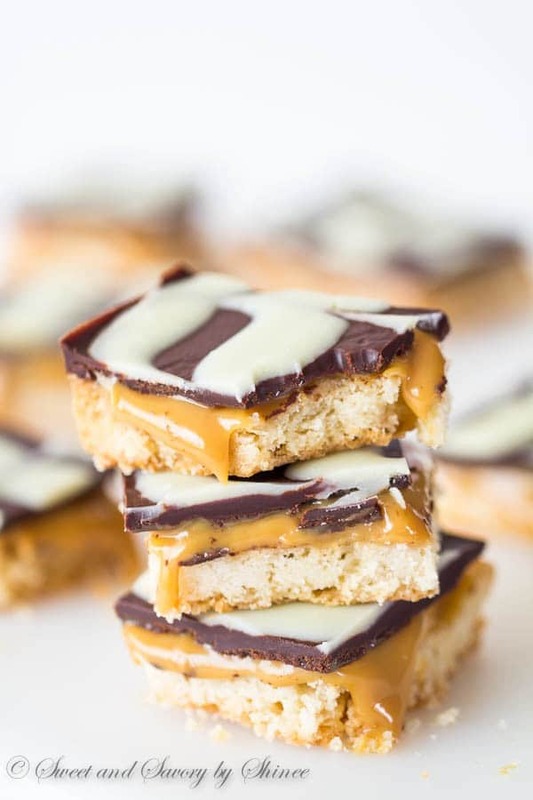 Pour the dark chocolate mixture over the caramel. Then pour the white chocolate mixture in long strip, as pictured above. Using a toothpick, swirl the two chocolates and let it set. Cut into about 24 small squares before serving. These bars freeze perfectly. Simply place in airtight container and freeze for up to 3 months. Bring it to room temperature (takes about 15min) before serving.